In 1968 Melvin Conway pointed out a seemingly inevitable symmetry between organisations and the software systems they construct. Organisations today are more fluid than 40 years ago, with short developer tenure, and frequent migration of individuals between projects and employers. In this article we’ll examine data on the tenure and productivity of programmers and use this to gain insight into codebases, by simulating their growth with simple stochastic models. From such models, we can make important predictions about the maintainability and long-term viability of software systems, with implications for how we approach software design, documentation and how we assemble teams. I've always been interested in legacy software systems, primarily because legacy software systems are those which have proven to be valuable over time. The reason they become legacy – and get old – is because they continue to be useful. I have an interest in that as a software engineer, having worked on legacy systems as an employee for various software product companies, and more recently as a consultant with Sixty North, helping out with the problems that such systems inevitably raise. I called myself a "software engineer", although I use the term somewhat loosely. To call what many developers do "engineering" is a bit of a stretch. Engineer or not, my academic training was as a scientist, which is perhaps reflected in the content of this article. 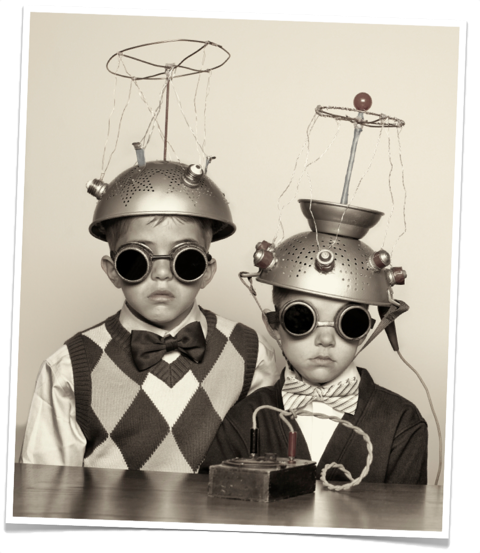 Most readers will be familar with the structure of the scientific method: We ask questions. We formulate hypotheses which propose answers to those questions. We design experiments to test our hypotheses. We collect data from the experiments. And we draw conclusions from the data. This done, having learned something about how our world works, we go round again. I would like to be able to apply this powerful tool to what we do as "software engineers" or developers. Unfortunately for our industry, it's very difficult to do experimental science - still less randomised controlled trials – on the process of software development, for a whole host of reasons: Developers don't like to be watched. We can't eliminate extraneous factors. The toy problems we use in experiments aren't realistic. No two projects are the same. The subjects are often students who have little experience. Even on the rare occasions we do perform experiments, there are many threats to validity of such experiments, so the results tend not be to taken very seriously. Addressing the weaknesses of the experimental design would be prohibitively expensive, if possible at all. Fortunately, there's another way of doing science, which doesn't rely on the version of the scientific method just mentioned. It's the same type of science we do in astronomy, or geology where we can't run experiments because we don't have enough time, we don't have enough money, or we just don't have anywhere big enough to perform the experiment. Experimentally colliding galaxies, or experimenting with the initiation of plate tectonics are simply in the realms of science fiction on the money, time and space axes. In such cases, we have to switch to a slightly different version of the scientific method, which looks like this: We make a prediction about how the universe works, where our 'universe' could be galactic collisions, or the more prosaic world of software development. We then make a model of that situation either through physical analogy or in a computer. By executing this model we can predict the outcome based on the details of a specific scenario. Lastly, we compare the results from the model with reality and either reject the model completely if it just doesn't work, or tune the model by refining, updating or tweaking it, until we have a model that is a good match for reality. The aim here, is to come up with a useful model. Models are by their very nature simplifications or abstractions of reality. So long as we bear this in mind, even a simple (although not simplistic) model can have predictive power. A key factor in modelling the development of legacy software systems is the fact that although such systems may endure for decades - we developers tend not to endure them for decades. In other words, the tenure of software developers is typically much shorter than the life span of software systems. Whenever I speak publically on this topic with an audience of developers, I like to perform a simple experiment with my audience. My assumption is that the turnover of developers can be modelled as if developers have a half-life within organizations. The related concept of residence time  is probably a better approach, but most people have a grasp of half-life, and it avoids a tedious digression into explaining something that is ultimately tangiential to the main discussion. In any case, a catchy hook is important when you're going for audience participation, so half-life it is. I start by asking everyone in the audience who has moved from working on one codebase – for example a product – to another (including the transition to working on their first codebase), at any time in the preceding 32 years to raise their hands. This starting point is intended to catch the vast majority of typical tech conference audience members, and indeed it does, although arguably in the spirit of inclusiveness I should start with 64 years. Now all of the audience have raised hands. Next I ask the audience to keep their hands raised if this is still true for 16 years: Most of the hands are still raised. Now eight years: Some hands are going down. Now four years: A small majority of hands are still raised. Then two years: At this point, a large minority still have raised hands, but we have crossed the half-way threshold and established that the 'half-life' of developers is somewhere between two and four years. This result has been consistent on over 90% of the occasions I've performed this experiment. The only notable deviation was a large Swedish software consultancy where we established the half-life was around six months! In fact, what little research there has been into developer tenure indicates that the half-life across the industry is about 3.2 years, which fits nicely with what I see out in the field. One way to think about this result concretely is as follows: If you work on a team that numbers ten developers in total, you can expect half of them - five in this case - to leave at some point in the next 3.2 years. Obviously, if the team size is to remain constant, they will need to be replaced. Note that saying that turnover of half of a population of developers will take 3.2 years is not the same as claiming that the average tenure of a developer is 3.2 years. In fact, mean tenure will be \(3.2 / \\ln 2\) which is about 4.6 years. You might want to compare that figure against your own career so far. 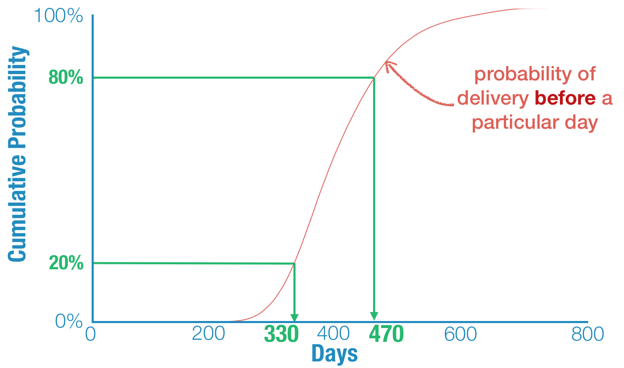 If you're concerned that developers don't behave very much like radionucleides then rest assured that the notion of half-life follows directly from an assumption that the decay of a particle (or departure of a developer) follows exponential decay, which again follows from the notion of constant probability density with respect to time. All we're saying is that in a given time interval there is a fixed probability that are particle will decay (or a developer will depart), so it is actually a very simple model. Notably, the half-life of developers is shorter than the half-life of almost anything else in our industry, including CEOs, lines of code, megacorps or classes. Half-lives in years of various entities in and around the software industry. Developers are one of the most short-lived. If we're going to have a stab a modelling software developers as part of the software development process, we're going to need some measure of productivity. I'm going to use - and you can save your outrage for later - lines of code. To repurpose a famous phrase by Winston Churchill: "Lines of code is the worst programmer productivty metric, except for all the others". Now I know, as well as you do, that what ultimately matters to the customers of software systems is value for money, return on investment, and all those other good things. The problem is, that it's notoriously hard to tie any of those things back in a rigourous way to what individual developers do on a day-to-day basis, which should be design and code software systems based on an understanding of the problem at hand. On the other hand, I think I'm on fairly safe ground in assuming that software systems with zero lines of code deliver no value, and proportionally more complex problems can be solved (and hence more value delivered) by larger software systems. Furthermore, there's some evidence that the number of lines of code cut by a particular developer per day is fairly constant irrespective of which programming language they're working in. So five lines of F# might do twice as much 'work' as 10 lines of Python or 20 lines of C++. This is an alternative phrasing of the notion of 'expressiveness' in programming languages. This is why we tend to feel that expressiveness - or semantic density - is important in programming languages. We can often deliver as much value with 5 lines of F# as with 20 lines of C++, yet it will take a quarter of the effort to put together. Now, however you choose to measure productivity, not all developers are equally productive on the same code base, and the same developer will demonstrate different productivity on different code bases, even if they are in the same programming language. In fact, as I'm sure many of us have experienced, the principle control on our productivity is simply the size of the code base at hand. Writing a hundred lines of code for a small script is usually much less work than adding 100 lines to a one million line system. We can capture this variance by looking to what little literature there is on the topic , and using this albeit sparse data to build some simple developer productivity distributions. For example, we know that on a small 10,000 line code base, the least productive developer will produce about 2000 lines of debugged and working code in a year, the most productive developer will produce about 29,000 lines of code in a year, and the typical (or average) developer will produce about 3200 lines of code in a year. Notice that the distribution is highly skewed toward the low productivity end, and the multiple between the typical and most productive developers corresponds to the fabled 10x programmer. Given only these three numbers and in the absence of any more information on the shape of the distribution, we'll follow a well-trodden path and use them to erect a triangular probability density function (PDF) characterised by the minimum, modal and maximum productivity values. Based on this PDF it's straightforward to compute the corresponding cumulative distribution function (CDF) which we can use to construct simulated "teams" of developers, by using the CDF to transform uniformly distributed samples on the cumulative probability axis into samples on the producivity axis. In a real simulation where we wanted to generate many typical teams, we would generate uniform random numbers between zero and one and transform them into productivity values using the CDF, although for clarity in the illustration that follows, I've used evenly distributed samples from which to generate the productivity values. 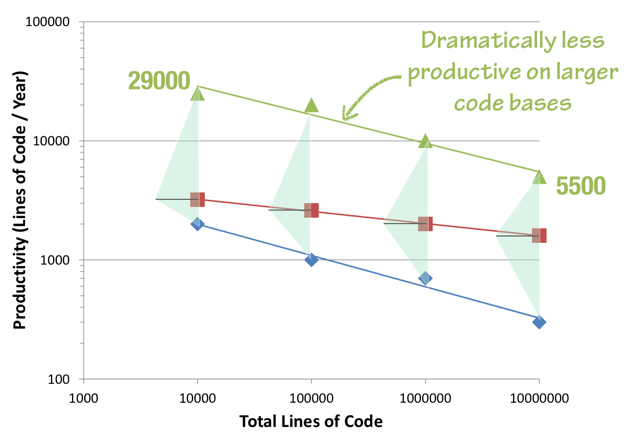 Programmer productivity in lines of code per year for a team of ten developers on a 10000 line project. As you can see the resulting productivity values for a team of ten developers cluster around the modal productity value, with comparitavely few developers of very high productivity. 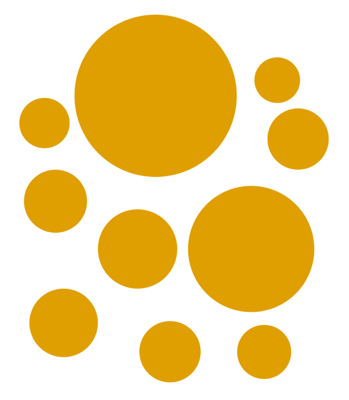 A typical team of ten developers would look like this, if their contributions in lines of code were represented as circular areas. This typical team has a only a couple of people being responsible for the majority of the output. Again, it might be interesting to compare this to your own situation. At the very least, it shows how the 'right' team of two developers can be competitive with a much larger team; a phenomenon you may have witnessed for yourselves. Overall, this team produces about 90,000 lines of code in a year. Productivity is a function of codebase size. Developers are dramatically less productive on larger bodies of code. When performing a simulation of growth of software in the computer, we can get more accurate results by reducing the time-step on which we adjust programmer productivity downwards from once per year as in the example above, to just once per day: At the end of every simulated day, we know how much code we have, so we can predict the productivity of our developers on the following day, and so on. With components of variance in developer productivity, its relationship to code base size and a simple model of developer turnover we're ready to run a simulation of a project. To do so, we initialize the model with the number of developers in the development team, and set it running. The simulator starts by randomly drawing a team of developers of the required size from the productivity distribution for a zero-size code base, and computes how much code they will have produced after one day. At the end of the time step, the developer productivities are updated to the new distribution; each developer's quantile within the distribution remains fixed, but the underlying CDF is updated to yield a new productivity value. The next time step for day two then begins, with each developer producing a little less code than on the previous day. On each day, there is a fixed probability that a developer will leave the team. When this occurs, they are immediately replaced the following day by a new hire whose productivity will be drawn anew from the productivity distribution. For small teams, this case shift the overall team productivity significantly and more often than not towards the mean. Streamed code contributions of a team of seven developers over five years. A total of 19 people contribute to this codebase. 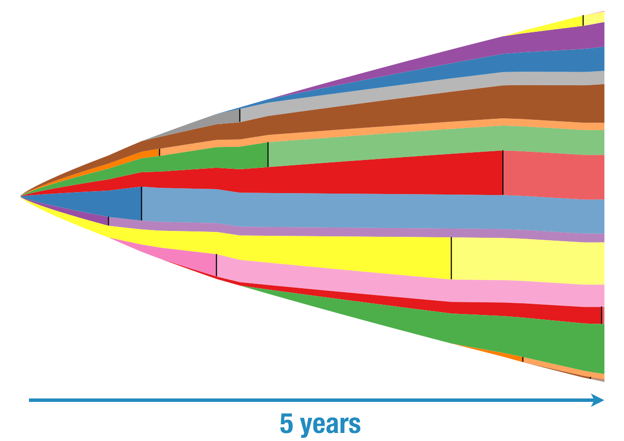 This figure has time running from left to right, and the coloured streams show the growing contributions over time of individual developers. We start on the left with no code and the original seven developers in the team, from top to bottom sporting the colours brown, orange, green, red, blue, purple and yellow. The code base grows quickly at first, but soon slows. About 180 days into the project the purple developer quits, indicated by a black, vertical bar across their stream. From this point on, their contribution remains static and is shown in a lighter shade. Vertically below this terminator we see a new stream beginning, coloured pink, which represents the contribution of the recruit who is purple's replacement. As you can see, they are about three times more productive (measured in lines of code at least), than their predecessor, although pink only sticks around for around 200 days before moving on and being replaced by the upper blue stream. In this particular scenario, at the end of the five year period, we find our team of seven has churned through a grand total of 19 developers. In fact the majority of the extant code was written by people no longer with the organisation; only 37% of the code was programmed by people still present at the end. This is perhaps motivation for getting documentation in place as systems are developed, while the people who are doing the development are still around, rather than at the end of the effort - if at all - as is all to common. Being drawn randomly, each scenario such as the one outlines above is different, although in aggregate they vary in a predictable way according to the distributions we are using. The above scenario was typical, insofar as it produced, compared to all identically configured simulations, an average amount of code, although it did happen to get through a rather high number of developers. Of course, individual scenarios such as this, although interesting, can never be indicative of what will actually happen. For that, we need to turn to Monte Carlo modelling: Run many thousands of simulations - all with configurations drawn randomly from identical distributions - and look at the results in aggregate either graphically or using various statistical tools. When we run 1000 simulations of a seven person project run over three years, the following statistics emerge: We can expect our team of seven to see four people leave and be replaced during the project. 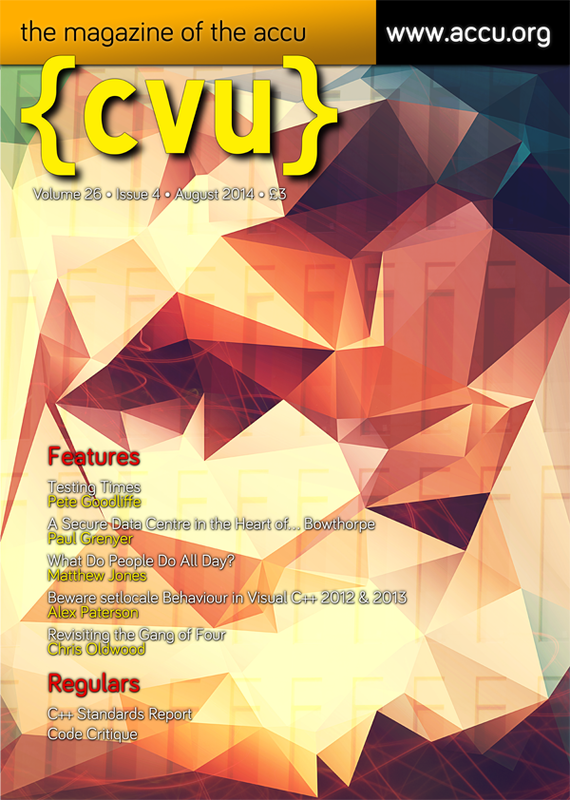 In fact, the total number of contributors will be 11 ± 2 at one standard deviation (1σ). The total body of code produced in three years will be 157,000 ± 23,000 @ 1σ. The proportion of the code written by contributors present at the end will be 70% ± 14% @ 1σ. Perhaps a more useful question might be to ask "How long is it likely to take to produce 100,000 lines of code?" By answering this question for each simulation, we can build a histogram (actually we use a kernel density estimate here, to give a smooth, rather than binned, result). How long does it take a team of seven to deliver one-hundred thousand lines of code? Although this gives a good intuitive sense of when the team will reach the 100 k threshold, a more useful chart is the cumulative distribution of finishing time, which allows us to easily recognise that while there is a probability of 20% of finishing in 330 days, for a much more secure 80% probability, we should allow for 470 days - some 42% longer and correspondingly more costly. 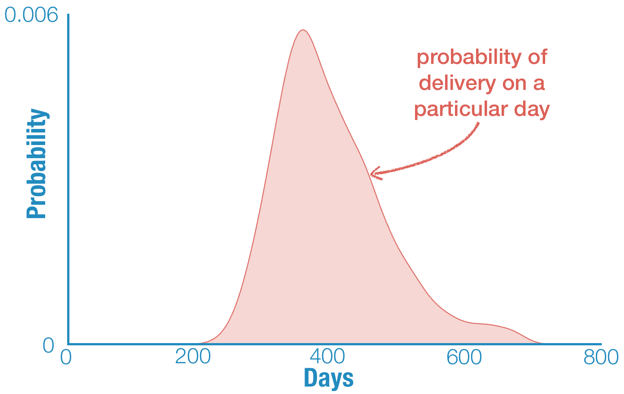 Cumulative distribution function showing probability of delivery of one-hundred thousand lines of code before a particular day. Based on 10 000 simulations. Finally, looking at the proportion of the code base that was, at any time, written by the current team, we see an exponential decline in this fraction, leaving us with a headline figure of 20% after 20 years. 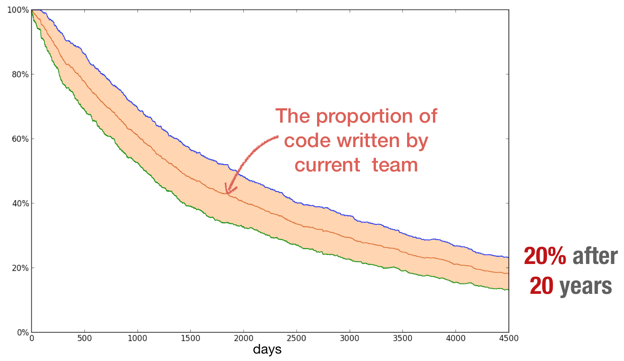 The proportion of code written by the current team. In other words, for how much of your code can you easily talk to the author? Blue and green lines show plus and minus one standard deviation around the mean. Based on 10,000 simulations. That's right, on a 20 year old code base only one fifth of the code will have been created by the current team. This resonates with my own experience, and quantitatively explains why working on large legacy systems can be a lonely, disorienting and confusing experience. A refinement of Conway's Law? This remark, which has become known as Conway's Law, was later interpreted, a little more playfully, by Eric Raymond as "If you have four groups working on a compiler, you'll get a 4-pass compiler". My own experience is that Conway's Law rings true, and I've often said that "Conway's Law is the one thing we know about software engineering that will still be true 1000 years from now". However, over the long term development efforts which lead to large, legacy sofware systems the structure and organisation of the system isn't necessarily congruent with the organisation at present. After all, we all know that reorganisations of people are all too frequent compared to major reorganisation of software! Rather, the state of a system reflects not only the organisation, but the organisational history and the flow of people through those organisations over the long term. What I mean is that the structure of the software reflects the organisational structure integrated over time. Simulations such as those presented in this article allow to to get a sense of how large software systems as we see them today are the fossilised footprints of developers past. Perhaps we can use this improved, and quantitative, understanding to improve planning, costing and ongoing guidance of large software projects. Residence time article on Wikipedia. Contrary to popular conception, straight lines on log-log plots don't necessarily indicate power-law relationships. See the excellent So You Think You Have a Power Law — Well Isn't That Special? Francis Galton (1886). "Regression towards mediocrity in hereditary stature". The Journal of the Anthropological Institute of Great Britain and Ireland (The Journal of the Anthropological Institute of Great Britain and Ireland, Vol. 15) 15: 246–263. Melvin Conway (1968) How do Committees Invent?